Youngstown, Ohio -- The Youngstown State women's soccer team dropped a 6-0 decision to Horizon League foe Valparaiso on Saturday evening at Farmers National Bank Field. The Penguins fall to 5-6 overall and 0-2 in the Horizon League while the Crusaders improve to 3-3-3 overall and 1-0-1 in the league. Valparaiso's Cory Griffith scored twice while April Cronin, the team's leading scorer, posted her fifth goal of the year to give the Crusaders a 1-0 lead at the 24:00 marrk. Cronin's goal came off a rebound in the box. Griffith scored in the 35th and 57th minutes while Michelle Mottenon scored her first goal of the year in the 59th and Shelby Oelschlager added her first goal in the 79th minute. 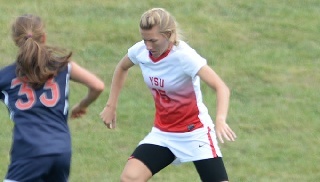 YSU scored an own goal in the 87th minute for the match's final score. Valparaiso out-shot the Penguins, 20-4. Youngstown State visits Cleveland State, Wednesday, Sept. 30, at 7 p.m. in Cleveland, Ohio.